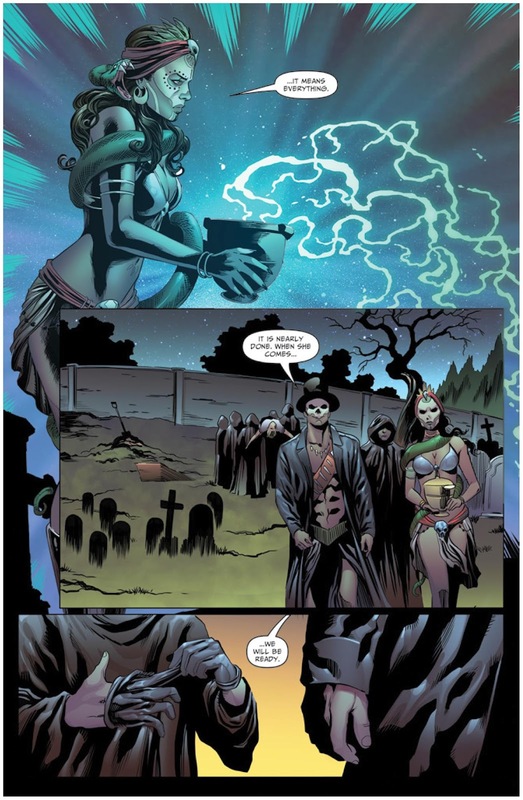 The Fellowship has obtained a first look at GRIMM FAIRY TALES: DAY OF THE DEAD #1 from Zenescope Entertainment. The issue, which hits stores February 1st, is written by Dawn P. Marquez, drawn by Allan Otero, colored by Erick Arciniega and lettered by Kurt Hathaway. Death holds no power over Mary Medina! Fresh out of Arcane Acre, Mary is on her own again. After receiving a mysterious note from a stranger named Talisman, she heads to New Orleans during Mardi Gras and finds herself pulled into the middle of a plot conspired by a long forgotten secret order. Can Mary stay one step ahead of them, or is this the day she joins the very dead she controls?